Hi, I am interested in your 1967 Chevrolet C/K Truck (stock #4660-ATL) listed on Autotrader for $31,995. I'd like to get more information about this vehicle and confirm its availability. With its super sharp two-tone exterior looking awesome and its long bed in back combining with excellent ground clearance, this 1967 Chevrolet K-20 is a sturdy classic workhorse. Its been more than a half-century since it first hit the pavement and yet you can still easily picture it transporting heavy loads over rugged terrain without even breaking a sweat. As a 67, this K-20 heralded the arrival of Chevys new Action Line pickups. Noticeably more modern than the previous generation, they bear a much stronger resemblance to todays modern trucks than to their counterparts of even a couple of years before and yet their vintage charm is undeniable. 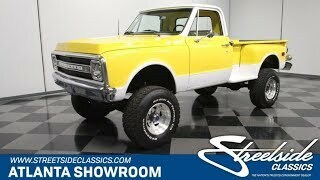 Decked out in yellow paint that gives way to white around its lower portion, its a great looking classic truck. The paint is very solid - it was likely applied only a little while back - and the exterior fittings, including a particularly sharp front grille, the side mirrors and the front and rear bumpers, all seem to be fairly new as well. The glass surrounding the cabin is nice and clear, and upon closer inspection youll notice that both the front and rear windshield seals were also recently replaced. With the added lift kit, the wheel clearance is substantial, which not only adds to this Chevys rugged style but also affords it some serious ability to navigate obstacles. The interior has been restored while retaining a factory appearance, with a bench seat at its center sporting a very fresh off white vinyl cover that blends perfectly with the door panels to each side and the sun visors just above. This was a thorough refurbishment - even the black rubber floor mat shows almost no wear to speak of and, from the looks of things, a lot of prep work went into readying the interior surfaces for their updated yellow paint. The dash area features a revitalized black accent that surrounds the collection of factory gauges in the instrument cluster - all of which are functional -and an aftermarket retro-looking AM/FM stereo with Bluetooth connectivity sits at the center and pairs with the kick panels to fill the cabin with sound. An aftermarket climate control system has also been added and its running great - youll have no trouble getting comfortable, regardless of the weather outside. The bed area has seen a lot of attention: its interior walls and liftgate are well protected by spray on bed liner painted to match the rest of the truck, and a new-looking wood bed lines its floor. Theres plenty of power on hand to drive this K-20s off-road escapades. The 350 cubic inch V8 underneath the hood has been armed with a 4-barrel Edelbrock carb and intake and sounds very strong - it also has a nice, mild lope that suggests theres a perf cam inside. Aftermarket headers lead out to a new Magnaflow exhaust and an HEI ignition has also been added to maximize available spark. The engine pairs with an automatic TH350 transmission that shifts very solidly and the surefootedness of four-wheel drive sits within easy reach of the driver. Power steering makes this classic truck easy to navigate, while power brakes that position discs up front bring its set of 15 steel wheels outfitted with sizable 35 BF Goodrich All Terrain tires to quick, dependable stops. Below, the undercarriage appears very solid. Looking sharp and ready for action, this 1967 Chevrolet K-20 would be the perfect score for the off-road enthusiast wanting to inject some vintage mojo into the mix. Call today!